I came across this beautiful little brand by complete coincidence. I was scrolling through a new blog I adore - friends in fashion - and she did a feature on fiel sol jewellery. "Each collection is designed with an emphasis on colour, texture, metals and the natural beauty of semi-precious stones. Fiel Sol blends the themes of antiquity with a modern edge - necklaces, rings, bracelets and earrings capture the beauty of ancient treasures with bold, vibrant colours." I honestly fell head over heels in love for the fiel sol jewellery collection. It's gorgeous statement pieces - the most fantastic cuffs and beautiful necklaces made from gorgeous stones and metals. It's the jewellery everyone wants for summer, and it's the type of pieces I see on a girl and wish I had the courage to ask where she got them. I'm saving up for the crown of atlantis necklace (first picture). I've decided it's the perfect statement necklace for my birthday outfit. Don't you think it would look stunning with my white toga dress? I definitely wouldn't mind investing in the aesa cuff either, the perfect combination. 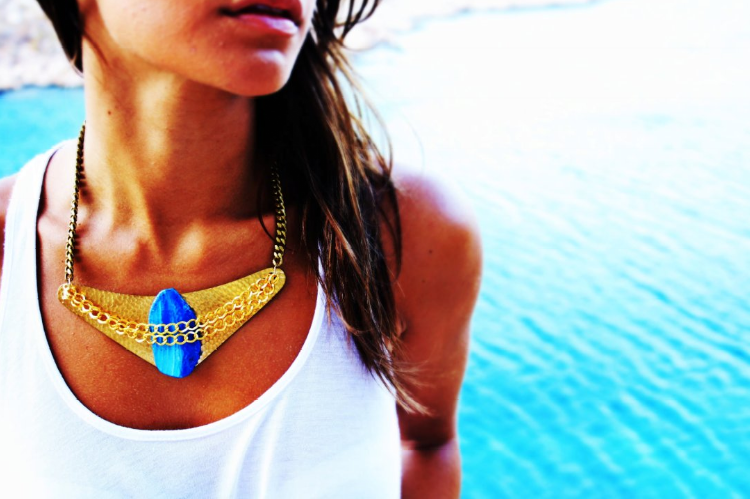 Make sure you check them out - fiel sol jewellery! i have a giveaway on my blog that i'm sure you will love!